Kerala, being God's Own Country and characterised by beautiful backwaters, vibrant beaches and summer stoppages, is one of the preferred destinations in India throughout the year, especially during the summers. As beaches and backwaters in Kerala remain less-interesting spots during the summer season, tourists often tend to pick its hill stations and cold places as their summer retreat. Are you looking for such places in Kerala where you can enjoy its beauty to the fullest? Well, then you need to consider planning a trip to these wonderful summer destinations in the Trivandrum district of Kerala, which are known for their lush green surroundings and uncrowded environment. Kallar is located at a distance of about 40 km from Trivandrum and is easily accessible by road. It is famous amongst local tourists for its green surroundings and Vamanapuram river, which flows through the town and enhances its overall charm. As the region of Kallar is rich in dense vegetation, you can also spot several beautiful species of plants and animals. It is also a perfect stoppage for bird lovers. Apart from all this, you can also go trekking, camping and photographing here. If you are keenly looking on spending your summer vacation amidst seclusion and serenity, then Kallar is a must-visit destination for you. You mustn't take any chance of missing this wonderful expansion of nature. Another beauty in the Trivandrum district of Kerala, Bonacaud is situated at a distance of about 50 km from the district centre and is popular for its green hills, tea estates, waterfalls and rich vegetation. You can find everything within the boundaries of Bonacaud which can certainly make your summer weekends refreshing and cool. It generally serves as the base camp for travellers trekking up the Agasthya Malai. Bona Falls and Vazhvanthol Waterfalls are a few water cascades which will certainly interest you. So, what do you think of exploring this gorgeous summer retreat in the Trivandrum district of Kerala? When the talk is about hill stations or summer destinations in Kerala, especially the uncrowded and unexplored ones, then Ponmudi has to be added to the list, without which the list is certainly incomplete. 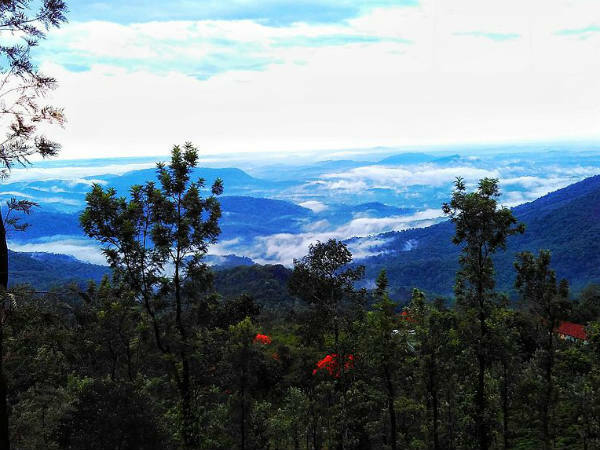 Located at a distance of about 55 km from Trivandrum, Ponmudi is nestled wonderfully in the Western Ghats and is home to innumerable natural sites, ranging from view points to hills, rivers to waterfalls and forests to grasslands. Even though it is only popular amongst local tourists, it is still visited by several offbeat travellers every year. If you are looking for a haven settled in seclusion, then Ponmudi is the place in the Trivandrum district where you should be this season. The area is also rich in diverse wildlife and hence, you can spot several endangered species of animals, birds and plants. You can also go trekking and camping here. Agasthyarkoodam is one of the highest peaks in Kerala and is heaven for trekkers in the state. It is located at a distance of about 40 km from Trivandrum city and is also popular amongst nature lovers and photographers as the region is rich in diverse wildlife and its tops provide its visitors with the panoramic views of green surroundings. Agasthyarkoodam is also a place of religious and historical significance as it is home to the temple dedicated to sage Agastya, who is considered as one of the prominent sages of all time. Being a pilgrimage centre, it is visited by hundreds of Hindu devotees every year. Hence, Agasthyarkoodam is a perfect mix of nature, history and spirituality. Therefore, it shouldn't be missed by any traveller or tourist. Vithura is located at about 30 km from Trivandrum city centre and is one of the popular attractions for local tourists in the district. It is famous for its tea and rubber plantations. Being a hill station, Vithura is also home to several natural sites which are visited by hundreds of tourists every year. The prominent places which you must not ignore while in and around Vithura include Meenmutty Waterfall, Bonacaud Tea Gardens, Golden Valley, Thavakkal Waterfall, Peppara Dam and Kallar river. Isn't it a beautiful place filled with numerous surprises in the form of natural wonders?